Dr. P. J. Miller is back! Following his first installment, Cute Poodles, Sweet Old Ladies & Hugs, Dr. Miller has compiled another volume of truly awesome veterinary tales. Come along for the ride again as Dr. Miller delivers stories that feature colorful clients, endearing pets, his own beloved bulldog, and a hurricane. All the sassy hospital staff that readers came to love are back, including that special staff member who seems to work by her own particular standards of professionalism (you know the one). 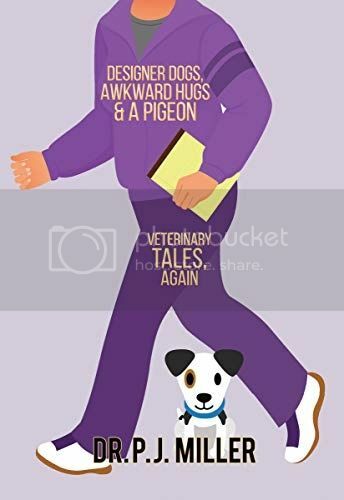 In Designer Dogs, Awkward Hugs & Pigeons, Dr. Miller goes behind the scenes of his veterinary practice to provide a true insider’s view into life as an animal doctor. Dr. Miller employs the same unique style of humorous storytelling that readers loved in his first novel. Hidden behind the humor, Dr. Miller gives a deeper glimpse into how emotional and strong the human-animal bond can be. A must read for any aspiring veterinary professional or animal lover.